My name is Robyn and I go by DarklyDragon online. 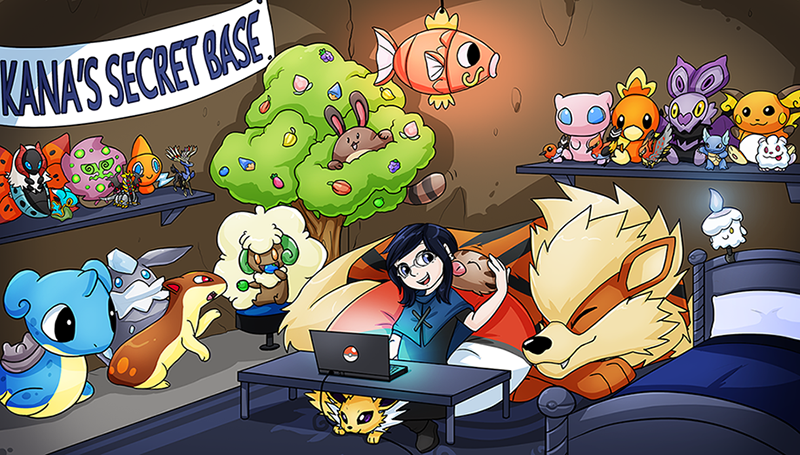 Kana’s Secret Base is my Pokemon collection site. I’ve been a Pokemon fan since 1998 and started collecting Pokemon items then as well. So I have a pretty large collection of random Pokemon stuff, though now I only collect specific ones. This collection site will be dedicated to the Pokemon I collect and the ones my husband DB collects as well. I will also be posting about interesting upcoming Pokemon item promotions and possibly information on the Pokemon games I play. I’ve been a Pokemon collector for over half of my life. I mainly play the Pokemon games and collect items featuring my favorite Pokemon. Outside of Pokemon, I collect Harry Potter items, Dolls (such as Pullips, Dals, and BJD’s), and My Little Pony Figurines. My favorite Pokemon main storyline game has to be SoulSilver. I also love Pokemon Rumble Blast and the Mystery Dungeon series. My favorite gamecube game is Pokemon Channel. I tend to love any of the Pokemon games where you are able to interact with the Pokemon in a bit more direct manner or where you are playing as a Pokemon.